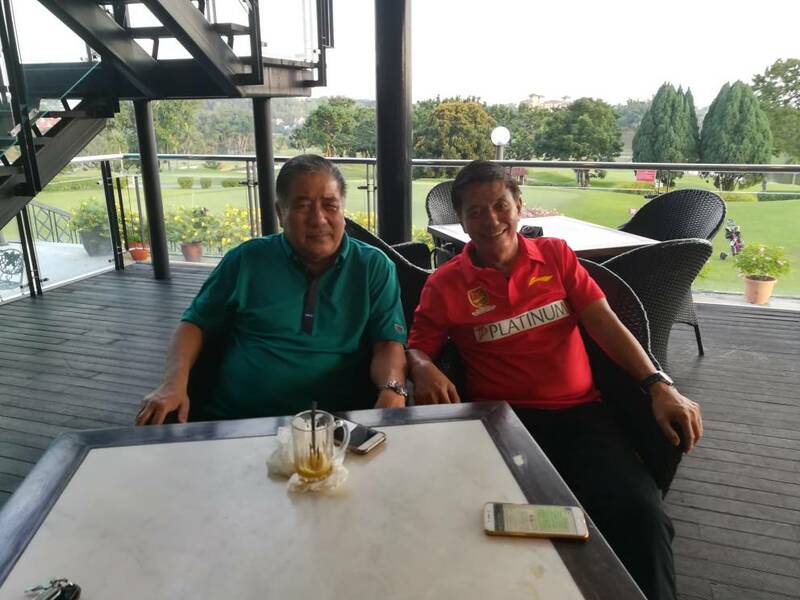 Cpt Tong Lye Heng (left), army veteran and Lt Col Wong Ah Jit, secretary of MACVA. Out of nowhere, a gunshot came from a distance and hit Captain Tong’s left hip. “I would come to learn later after the incident from my sentry that the enemy was already walking to a claymore mine, but since it was installed improperly, it did not explode," he recounted being shot by a Communist insurgent. Tong Lye Heng, now a 71-year-old army veteran was reliving the moment when he was fighting the communists in the dense forests of Grik, Perak during the 1970s and nearly lost his life defending his country. 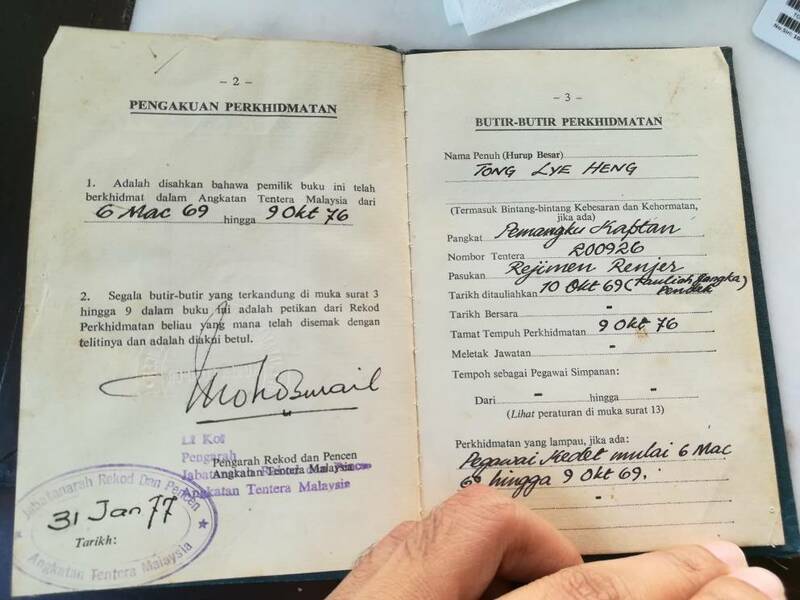 Now a proud member of the newly formed Malaysian Armed Forces Chinese Veterans (MACVA), Captain Tong's story is but one of the thousands of wounded and fallen unsung heroes who have put our nation's security first ahead of their personal life. Throughout the country’s 60 years of independence, the country has survived through many threats thanks to the sacrifices of our warriors, such as the communist insurgency during the 1970s, the Konfrontasi with Indonesia and recently, the invasion of Lahad Datu by the self-styled Sulu Sultanate challenging Malaysian sovereignty over Sabah. In conjunction with Warrior's Day, Malaysian Digest is putting the spotlight on our brave soldiers have been wounded and to honour those who lost their lives in the line of duty throughout the country’s history. Veteran Shares His Experience Fighting The Communist During The Emergency Cpt Tong Lye Heng (left), army veteran and Lt Col Wong Ah Jit, secretary of MACVA.Cpt Tong Lye Heng (left), army veteran and Lt Col Wong Ah Jit, secretary of MACVA. The trousers Captain Tong wore when he was shot on 10 June 1971. 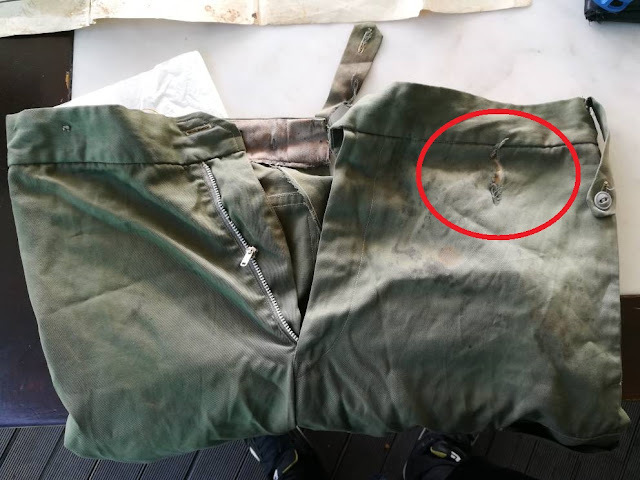 The hole in the right is where the bullet hit him in the hip, while the stains near the hole are blood stains from the wound. “I was assigned as the leader for 7th Ranger Platoon in the Sungai Petani camp. The 26 soldiers in that platoon were newly assigned to me at that time, so I did not know them very well. “The boys who I was familiar with, whom I spent three months in the jungle, were assigned to other posts,” recalled Captain Tong,” who joined the army on 6th March 1969. On 10th June 1971, his battalion established a base in the forest, and has placed claymore mines and other defenses around the outside perimeter of their base.